Christmas is fast approaching. Can we make a suggestion for a gift? Give the gift of an experience by taking art classes! You might remember the epic gift I gave Molly last year of "The 12 Dates After Christmas" where I planned dates for each month of the year. Each date was wonderful, but one of the most memorable and enjoyable things we did was take pottery classes together at Petersen Art Center in Sugarhouse. It was so fun to try something we weren't very good at and learn a bit, use our creativity to make choices about what we'd create and then carry it out, to immerse ourselves in a process simply for the sake of creation. Our instructor Mark Petersen was fantastic. He was fun, he was patient, he was encouraging and helpful. He made sure we had some successes but more importantly, that we enjoyed the process. We met some of the other instructors and they’re all great. It was fun to meet other students as well. There is one student who makes the drive from Utah County to Sugarhouse for weekly classes. I think that is a good endorsement of the Center. They offer painting and drawing classes in addition to pottery. Kids as well as adults can sign up! This is better than whatever “thing” you were thinking about giving. This is an experience. 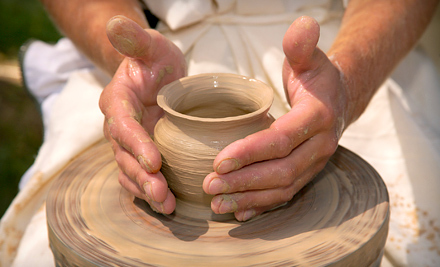 Even if someday our pottery breaks-- our experience endures. This is something we can do for years and years. This was something outside and apart from the stresses of life, the bills, the house projects, the differences in opinions and interests, the decisions about the best way to help our kids or live our lives. This was something that Molly and I could do together. It’s a great date and it's a great way to cultivate a relationship. We told Mark (our fabulous instructor) how much we enjoyed our classes and that we wanted to say something good about him and the Peterson Art Center. He was thrilled with the endorsement and wants to give or readers a serious deal. You won't regret it! Normally, the cost of taking a class (painting, pottery, etc) is $90/month. They are doing a special right now for Christmas offering classes for $49/month (per person). But if you CALL, DROP-IN, or email info@petersenartcenter.com BEFORE CHRISTMAS and mention our names (Vic and/or Molly Jackson) and that you read this blog you can sign up for classes for just $39/month. This is a steal of a deal! You'll have such a great time, learn a new skill, meet new people, and if you go as a couple...you'll have a bonding experience that will bring about world peace. Your house will start self-cleaning and your kids will be perfect angels. It's totes worth it. (I think Molly wrote this last sentence). sounds great..i would totes do that if we were closer! Andrew took a pottery class at BYU and made some cool stuff!